North Jakarta and Seribu Islands Fire and Rescue Sub-dept. is holding fire training in RW 15 Lagoa Urban Village, Koja, Sunday (7/1).
" 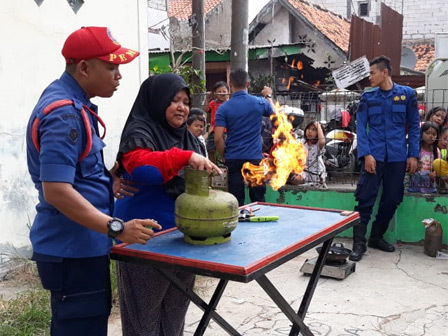 Materials that we give are like how to handle gas stove fires, put out the flames with sacks and APAR"
Satriadi Gunawan, Head of North Jakarta and Seribu Islands Fire and Rescue Sub-dept. said it is participated by 40 residents and representatives of RT/RW, mosque caretakers, PKK, and karang taruna. "Materials that we give are like how to handle gas stove fires, put out the flames with sacks and APAR," he stated. It is expected to improve the skills and preparedness of citizens facing fire disasters. By so the losses due to fire can be minimized and anticipated. "The aim is to create people that are concerned about the threat of fire and can minimize the incidence of fire," he said.